ride4acure » Blog Archive » Tuesday 9th August: Journey home begins early in the morning. Tuesday 9th August: Journey home begins early in the morning. 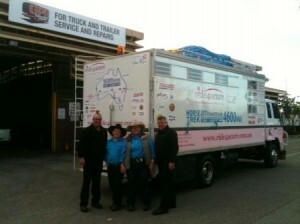 In preparation to begin the almost 5 000 km journey home tomorrow the awesome crew at GPR Truck Service & Repairs in Welshpool WA, generously donated a full service to our ride4acure truck. Perth has been a rich experience for us all. The fantastic support here at the Riding for the Disabled facility in Claremont providing us with a ripper paddock for our three horses. RDA is facilitated by M’Liss Henry who is an incredibly hard worker spending every hour of daylight working with riders and looking after the horses and facilities. They house dozens of horses here and there is a big crew of hardworking volunteers keeping things going. Met and talked with many of the students (we had our truck pulled up right along side the arena and had many a yarn over the fence! A massive thank you to the M’Liss for her generosity. We’re only really beginning to feel the reality that the trek is completed, well the riding side anyway! We’ve got several fundraisers and a couple of parties we’re going to on the way home including a 500km ‘detour’ to go to a friends 21st at Ivanhoe in Western NSW on August 20th which fits in just nicely with our itinerary for travelling back home. Of course we have to deliver the little champ ‘Surprise’ back to his owners Bill and Barb Willoughby at Booloroo Centre ( near Port August SA) then head to Gawler to pick up ‘Lofty’ which we’re looking forward too. I’ll have an ache in heart leaving ‘the little fella’ behind….he’s been a ripper trek horse, stepping up into Lofty’s place when we had to leave him behind in Gawler. The bonds between ourselves and the horses is strong, knowing that without their willingness we wouldn’t have had a trek. We did. And what a ripper success it’s been. Whilst we’re in Gawler Joe has business to attend to. He’s been collecting scrap metal and recyclable bottles/cans for the last two months and he’s going to cash them all in! He’ll have quite a bit of pocket money out of his little venture. We have about ten Mitavite bags under a tarp on the roof of the truck with Joe’s collection in it. Joe’s lucky to still have it, as Esther’s threatened a few times to chuck the lot when she’s had to unload chaff we store on the roof under a few tarps and has to move all Joe’s bags to get to it! Nothing like a little sibling ‘argy bargy’! We’re also having a gathering in Balranald on the night of 19th being organised by Megan Purtill whom we met on the way through. Looking forward to reconnecting with the many new friends made along the track. This entry was posted on Tuesday, August 9th, 2011 at 11:25 pm	and is filed under General. You can follow any responses to this entry through the RSS 2.0 feed. You can leave a response, or trackback from your own site. Godspeed Maura, Esther & Joe. It was a blast to have met you all. So glad I was able to do at least a little bit to welcome you into Perth. May you have a wonderful journey home.